What Do Cure Natural Aqua Gel Reviews Say? Today, I am writing a review about the most popular skin care product in Japan, an exfoliator. 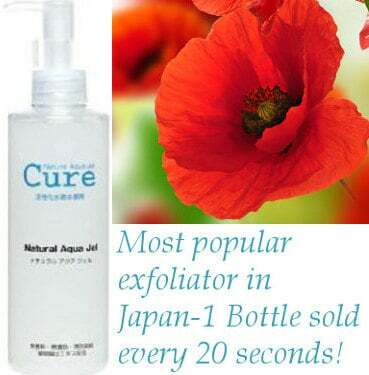 Its name is Cure Natural Aqua Gel and gathers excellent user reviews. It is quite impressive to read that one bottle of this product is being sold in Japan every 12 seconds. Here, I will inform you about what skin conditions it is best for, how to use it, people’s reviews, its ingredients as well as its pros and cons so that you get a better idea of whether Cure Natural Aqua Gel is suitable for you skin’s type and needs. As I have a sensitive combination skin myself which is prone to whiteheads and bumps if I don’t exfoliate well, I was particularly keen on digging deeper into this product. Especially since normal cleansers, makeup removers or even cleansing tools can either sometimes dry your skin too much, irritate or not even exfoliate adequately, the search for a gentle but at the same time effective exfoliator is more than needed. Now let me ask you a question: Have you wondered why your complexion is not sometimes as glowing as you would like it to be? One reason can be that dull skin is often due to dead skin cells that build up, causing your skin to take on that grayish cast and keep the new skin cells from shining through. Exfoliators are great for removing those dead skin cells and brightening up your complexion, however many exfoliants contain harsh ingredients that can redden or dry out your skin. Cure Natural Aqua Gel seems quite different. Its formula is said not to contain artificial coloring, fragrance, preservatives and alcohol although I will argue this last point later in the “cons” section. Made with Natural Plant Extracts– Cure is made from natural plant extracts including Rosemary, Gingko and Aloe Vera which are gentler on the skin than those harsh synthetic ingredients. While your skin may appear lighter due to the removal of all the dead skin cells that cause it to look darker or less bright, this product doesn’t contain any harsh skin lightening or whitening ingredients. No Artificial Coloring, Fragrances or Preservatives– It contains none of those ingredients that are known to cause dryness including those artificial colors, fragrances and preservatives. Without the addition of these skin drying ingredients, your skin is apt to retain more of its natural moisture. Non acidic and Purified Water Based Exfoliator– Because Cure is pure water based rather than having a heavy oil or cream base, it flows easier into those pores, lifting out those dead skin cells that tend to combine with your complexion’s natural oil and clog the pores resulting in acne breakouts and blackheads. 90% activated hydrogen water, non acidic and purified. Glycerin which is a moisturizing agent. Aloe Barbadensis Leaf Extract or Aloe Vera which moisturizes and protects. Rosemary leaf extract, having anti bacterial and anti inflammatory properties. 1. Start by washing your face with your normal facial cleanser and then pat it completely dry. 2. Put 2 or 3 drops of Cure on your finger tips and gently massage it into your skin in a circular motion. Do not rub or scrub it into the skin, but gently massage it. Because this is an extremely thin gel due to the high water content, it is best to use ½ or 1 pump of it at a time and apply that to one area of your face before pumping a bit more to add to another area. Then, gently massage the gel into the skin. 3. As you massage, you should see little white balls like spots appearing. These little balls are the dead skin cells that are being lifted from your face. Once you have completed massaging your face, then rinse off the gel with just warm and not hot water. 4. Afterwards, you can use cold water to close the pores. 5. Pat the skin dry. 6. Apply your normal skin moisturizer. What Do the Cure Natural Aqua Gel Reviews Have to Say? Let me first say that the reviews for this exfoliator are exceptionally good. People report this product as very gentle with their skin but at the same time extremely effective. Users really seem to feel that it works very well to remove those dead skin cells, so they give this product top marks. The unique thing with this product is that you can actually see that it’s doing the job since after applying a few drops and massaging it on your face, you will see some white spots popping up and turning into small balls which are dead skin cells that are getting disposed of your skin. Some people have argued whether these balls are actually dead skin cells but after exfoliating twice, you can see that no more white spots appear, so that means that those balls are dead skin cells indeed! A lot of users have mentioned that although seeing those white spots appearing looks a bit gross, the overall feeling is quite positive since they see that the product is actually working based on the results they get after exfoliating and that is smooth soft skin that feels light, refreshed and glowing. Lots of them also find that exfoliating with this product is a fun procedure and they use it in other areas apart from their face such as hands, neck, elbows or wherever the skin is dry. A lot of people also review that Cure Natural Aqua Gel works very effectively with dry patches of skin and some have seen positive results with the fading of their acne scars. People with dry skin report that it helped get rid of their flakiness, revealing a softer, nicer and clearer skin all together. People with sensitive skin have also mentioned that Cure Natural Aqua gel hasn’t irritated or caused any redness, tingling or burning to their skin. Also, according to few users, it doesn’t have any adverse effects when used in combination with Retinol. Cleanses the pores effectively and removes dead skin cells. Makes skin tone more even and brighter, complexion softer and pores tighter, so it is perfect before applying makeup with most of the times you not needing to use any primer at all. Helpful with dry skin patches. Softens acne scars and prevents breakouts. It contains Butylene Glycol, an ingredient which is essentially the same as Propylene Glycol and is a form of alcohol. Alcohol is not good for people suffering from Eczema, Contact Dermatis and some other skin conditions because it can irritate them. Some people feel that this product is a bit pricey but the quantity contained will last you for quite a long time. Also, if you consider its effectiveness and that for lots of people it is a “stick to” skin care product, you will find the money spent worthwhile. Overall, Cure Natural Aqua Gel reviews show us that this is a product worth trying out to get a gentle as well as effective skin exfoliating. 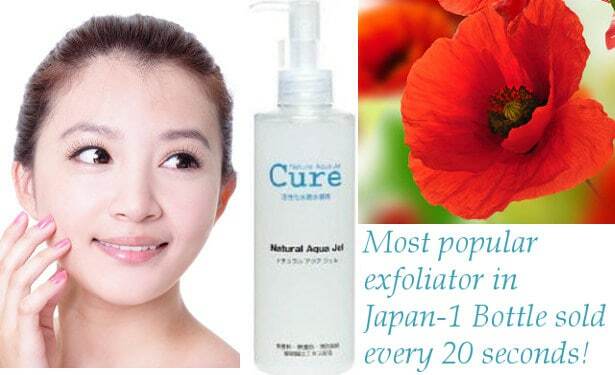 It is a best selling skin care product in Japan with people all over the world reviewing it positively.